Chocolate Cheesecake Cupcakes. All the decadence & only 200 calories! 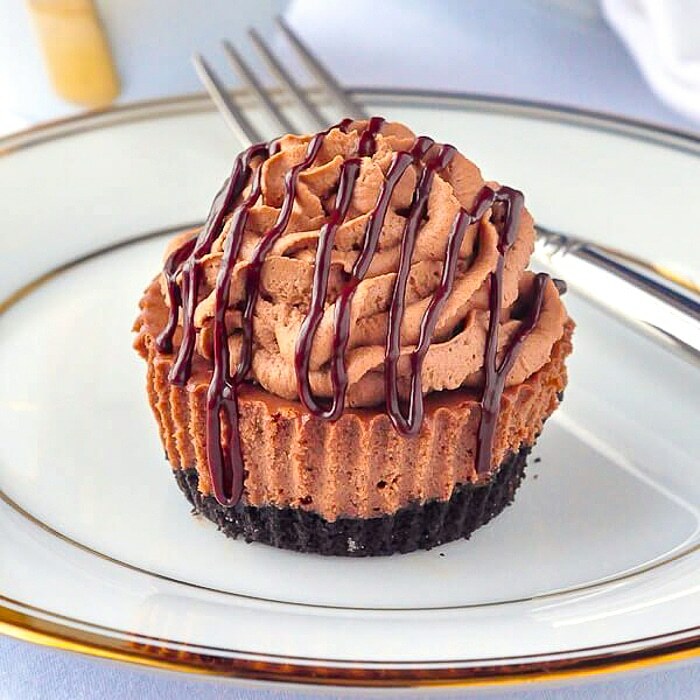 Chocolate Cheesecake Cupcakes. 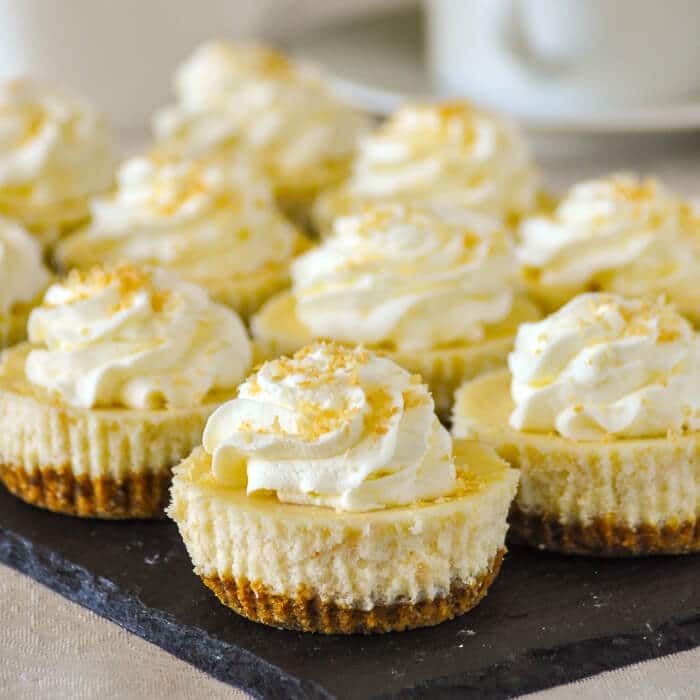 At only about 200 calories each, this recipe makes 12 perfectly portion controlled mini cheesecakes that you can enjoy without the guilt of overindulgence. Making mini cheesecakes, like these Chocolate Cheesecake Cupcakes, is quickly becoming our favourite way to enjoy this favourite dessert at our house. The recipe is only about 1/3 the size of a full size cheesecake recipe but makes 12 satisfying cheesecake servings. Let’s face it, cheesecake portions, especially restaurant servings are far too large anyway. Spouse and I most often would share a slice anyway when we order it off a menu. While you could easily serve 2 of these per person if you like, I find that this size really does satisfy my sweet tooth cravings. One of the best benefits of making these chocolate cheesecake cupcakes, like any mini cheesecakes you decide to make, it that the individual portions are so easy to freeze without the toppings. Whenever you need them, they thaw quite quickly, usually in a half hour at room temperature, then you can top them with the chocolate whipped cream before serving. It’s a great time saver; plus you could just serve them with fresh berries and a little dollop of whipped cream if you like. I’m sure you could come up with your own signature combination to make this versatile idea suit any occasion. For other mini cheesecake ideas, try our Mini Raspberry Tuxedo Cheesecakes recipe or our Mini Black Forest Cheesecake recipe. 2017 Update. 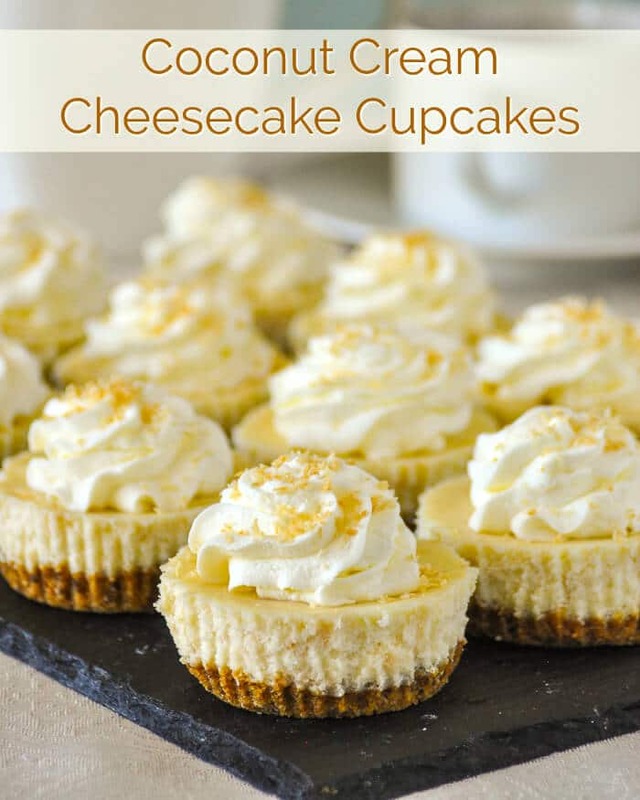 We have fallen in love with the idea of making cheesecake cupcakes at our house. It has become one of Spouse’s favourite things to take along to get togethers with her friends. Even those counting calories don’t feel guilty about having just one! They all think it’s a great idea. Our latest version is Coconut Cream Cheesecake Cupcakes! 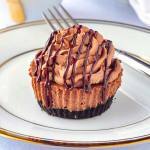 Like this Chocolate Cheesecake Cupcakes recipe? If you liked this recipe you may also want to try our Coconut Cream Cheesecake Cupcakes. 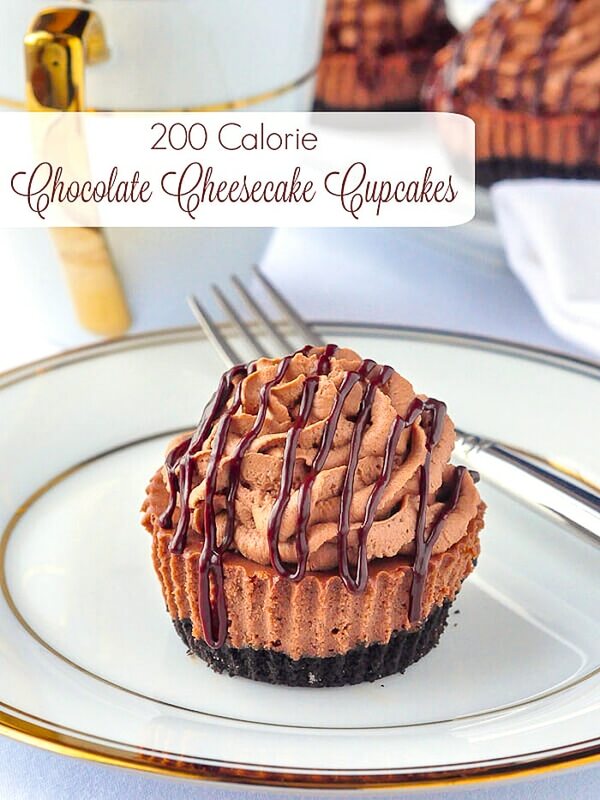 Chocolate Cheesecake Cupcakes - at only about 200 calories each, this recipe makes 12 perfectly portion controlled mini cheesecakes that you can enjoy without the guilt of overindulgence. Finally blend in the whipping cream until smooth. The whipping cream is still in liquid form when added, no need to whip it for the cheesecake batter. Divide the cheesecake filling equally between the 12 muffin cups and bake for 20 minutes or until the cheesecakes have set and do not jiggle when you give the pan a slight shake. Place the chocolate chips and 2 tbsp of the whipping cream in a heat safe measuring cup and microwave for a few seconds at a time, stirring the mixture each time until the melted chocolate mixture is smooth. Be careful not to overheat the chocolate. You need the temperature to be as close to the melting point as possible without getting any hotter. Let it cool to slightly lukewarm before proceeding to whip the cream. Whip the remainder of the 1 cup of whipping cream, the icing sugar and vanilla extract to firm peaks. Fold in the melted chocolate by hand into the whipped cream. Be as gentle as you can so as not to deflate the cream. Spoon or pipe the chocolate whipped cream onto the cooled mini cheesecakes. If you are piping the chocolate whipped cream it is best to chill it in the fridge for a half hour or so first to get better definition in the piping swirls. Garnish with a little drizzle of melted chocolate if you like before serving. Loved them – thank you! We had a hard time restraining ourselves from eating them all in one go. Baking them in cupcake form was super easy and was definitely the key to keeping the indulgence under control!! Just wondering if semi-sweet chips will work as well as dark? 🙂 Thank you! Got a Rock Recipe cookbook for Christmas and looking forward to trying some new recipes!! They should work. I just casually use dark for everything because I love it. These are delicious!! Question though – for the whipping cream (I used Nutriwhip), when the recipe calls for it, is this prepared whipping cream or just the liquid and then whip when all is ready? My topping was too thin to pipe on. I just put a dollop on top. Still so tasty!! Thank you! Nutiwhip is not whipping cream. Only real dairy whipping cream is what I use. Did you use it in the cheesecake batter too? Is the cookie crust made with Oreos? Is the crust made with Oreos? Oreo cookie crumbs, not the actual cookies. How far in advance can you make the cream topping? A day if you pipe it on right away. Usually holds up okay. I am a little confused on the whipping cream…do I pour it in as a liquid or do I whip up the cream first before I out it into the cheesecake batter? Looks delicious! Auto correct strikes again in this case. I’ve corrected whipped to “whipping” cream and made the instruction more clear in the text. Barry. Thanks so much will give these a try later today! Are you able to freeze these. Just made these Nd they are Fantastic my husband and kids loved loved loved them. I’m originally from NL West Coast and I refer to your site a lot and have to say your recipes are easy to follow and always turn out great. Thanks for keeping Newfoundland food alive Nd I love the fact that you have such a diverse list of recipes not just east coast. I cook food from all over the workd and rarely make the same dish in a month so I appreciate the options you provide. Great job Barry congrats on your success.